From left to right: James Deakin, Andrei Felix, Mico Halili, Dr. Freddie Gomez, Angel Jacob, Anthony Pangilinan and Amelyn Veloso. CNN Philippines held its trade launch last December 7 to unveil its upcoming programs to partners and advertisers assembled at the Shooting Gallery Studios in Makati. Among the programs set to air at the local CNN station are The Insider, a weekly political program to be hosted by political analyst Gilbert Remulla; Hoop Nation, a mini-documentary about the Filipino's fascination with basketball, hosted by American sports journalist Rafe Bartholomew; and My Philippines, a new half-hour local travel program. Also included in the lineup are programs to be hosted by filmmaker Pepe Diokno and journalist Jessica Zafra called Trippies; and Harvest, a food program featuring international chef and restaurateur Margarita Forés. In addition, Nine Media Corporation President Armie Jarin-Bennett also revealed plans to include a daily entertainment program, as well as a business newscast in the current programming grid of CNN Philippines. 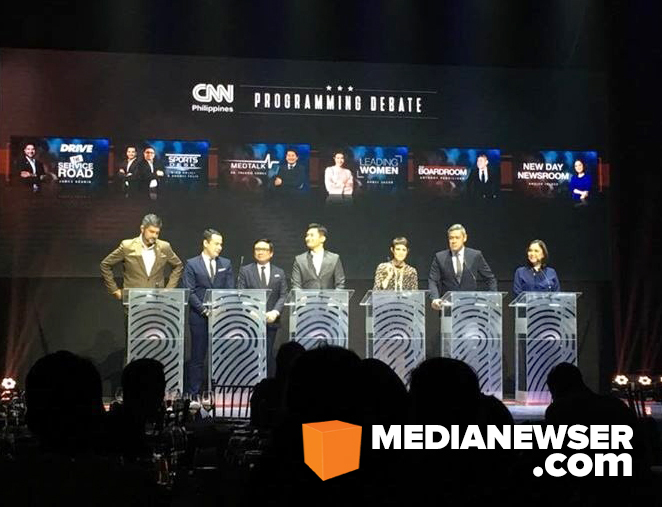 The event, which was themed after the highly successful PiliPinas Vice Presidential Debate, also used the presentation to re-introduce some of the network's existing programs, with the likes of James Deakin, Andrei Felix, Mico Halili, Dr. Freddie Gomez, Angel Jacob, Anthony Pangilinan and Amelyn Veloso participating in a mock "programming debate" hosted by Pia Hontiveros and Pinky Webb. The network will soon roll out promo plugs for their new offerings which are all set to air in early 2017.